Pesto has to be one of the easiest things to make. I hit the local Farmer's Market and pick up whatever looks and smells delicious. 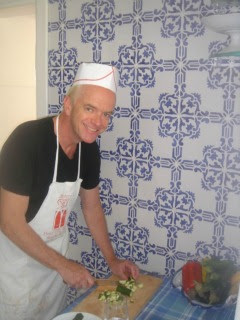 I first learned how to prepare Pesto in a class in Spain. The teacher used parsley, basil, hazelnuts﻿, parmesan and garlic. She had us combine the ingredients using a mortar and pestle. There was some wonderfully fragrant lemon basil at the Farmer's Market on Saturday. I also picked up cilantro, flat leaf Italian parsley and fresh garlic that had scapes. I combined these ingredients along with lemon zest, fresh squeezed lemon juice and Extra Virgin Olive Oil, salt and fresh ground pepper. You don't have to measure anything - just toss it all in the cuisinart (I don't have a mortar and pestle). I went easy on the cilantro - a little goes a long way. Instead of hazelnuts I used mixed nuts - I had a can in the cupboard. My first attempt came up kind of soupy, but that's the great thing about pesto - just toss in more basil and parsley until you have the consistency that you want. sautéed sliced cherry tomatoes and garlic and combined the pasta, pesto, parmesan and lemon juice in the sautée pan along with some of the pasta water. It was delicious!